The project aims to respond to specific demands of the municipality, in an expansion of public functions from the central area in the form of open spaces and a building. 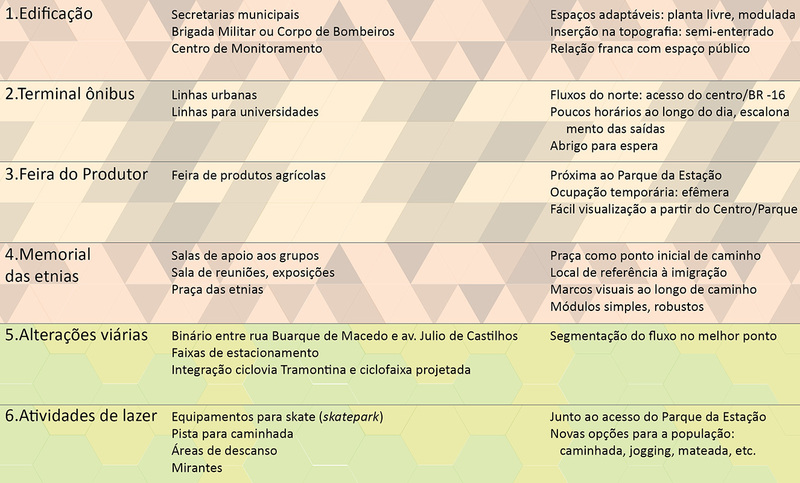 Configure build support for public activities, skate park, intercity bus terminal, venue for fair of the Producer, Memorial of Ethnicities, and change in access to the Centre through the binary expansion of Júlio de Castilhos streets and Buarque de Macedo, reconfigure parking lanes and return and qualify the former domain of the RFFSA range in the area of intervention. The project aims to still recognize the festivities and cultural activities carried out in the municipality, respect the current setting of the Centre and the station Park projects (arq. Carlos M. Fayet and team), the Boardwalk (the same team) and the street Covered (arq. Efreu Quintana). Search the continuity and connection to Center, interpreting the structure of the station Park to set the layout of the new urban space, with continuity to the leisure areas, deployment of skate park, square with playground, area of contemplation and public building to House supporting functions and the memorial of ethnicities. 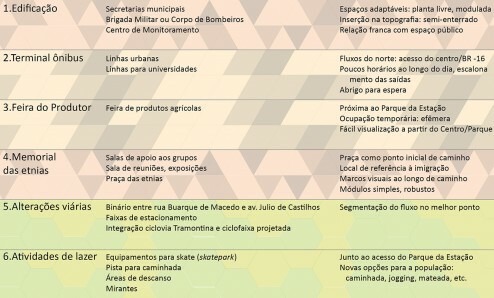 In addition, in order to reorder the flow of vehicles and allow deployment of a bus terminal have been proposed roadway changes: binary between Júlio de Castilhos pathways and Buarque de Macedo, with the access point to better match the topography, configuration of parking areas for individual vehicles and buses along the, deployment of bicycle paths to connect two existing stretches South and northern area. The design of the areas is defined according to a contemporary language that values clarity and miscegenation between the urban and the natural, interpreting the topography to enhance the possible Visual area, integrating natural elements with equipment and urban furniture. The building fits the topography seeking the materiality of regional stone and wood, with stronger elements from the Rua Buarque de Macedo and lightness above the level of the Av. Júlio de Castilhos. The terminal is deployed for the decrease in the perceived volume, but protecting users from rain and cold wind from Southeast. By: 3C Arquitetura e UrbanismoFiled under Urban Design, Integrated Intervention, Urban Planning, Projects. Bookmark the permalink. View EXIF Data.